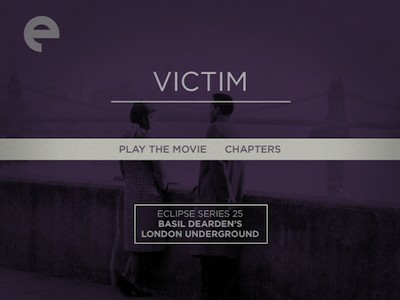 Basil Dearden is a name that is new to me, and so once again, Criterion's Eclipse Series has created a primer on a lesser-known filmmaker, putting together an intriguing boxed set that should provide an entertaining cinematic expedition for adventurous viewers. The 25th box in the collection, Basil Dearden's London Underground brings together four of the director's movies, made between 1959 and 1962, after the filmmaker had left Ealing Studios and struck out on his own. The movies here show the same mannerisms and penchant for light entertainment as was that studio's trademark, but Dearden's work nearly subverts the tradition with a progressive social conscience. In a way, Basil Dearden's London Underground shows us the bridge between post-War complacency and the cultural explosion of the 1960s. There are touches of the Kitchen Sink movement, though Dearden's aesthetic isn't as starkly realistic; rather, he practically creates his own reality, melding the familiar world of moviehouses with a point of view uniquely his own. The box leads with Sapphire (92 minutes), a 1959 crime drama written by Janet Green. The film opens on a grisly scene: a dead girl being discovered in a pile of leaves in a public park. The color film stock of the late 1950s gives Sapphire a look that is more pastel than painterly, adding a surreal glimmer to the scene, as if Dearden wanted to undercut the murder's harsh effects by making it easy on the eyes. The dead girl is Sapphire, and the mystery of who she is ends up being just as important as the circumstances surrounding her death. 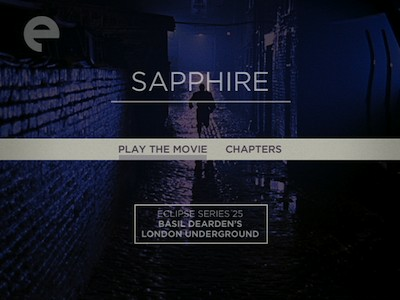 Sapphire is structured to lead viewers from the discovery of the body through all the steps the police take to solving her case. It's so straightforward, it struck me as having more in common with television police dramas of the period than with big-screen crime pictures. Superintendent Robert Hazard (Nigel Patrick) and Inspector Phil Learoyd (Michael Craig) could have easily been spun off into a Dragnet: London series. While the one-two-three of the plot is not all that innovative, Sapphire is notable for the nature of the crime. As the girl's background is uncovered, racial tensions in English neighborhoods are also exposed. Dearden follows the investigation through all levels of social life, be it the whites-only college hang-outs or buttoned up middle-class homes, or the out-of-the-way black nightclubs and the more posh "international club" where immigrants of all stripes congregate. Though the storytelling can be stiff and the morality a bit obvious for modern sensibilities, when Sapphire is placed in its proper context, Dearden and Green should be seen as daring commentators who took a risk by being up front about the sticky hypocrisies and hidden animosity that polite society often covered up. Watching Sapphire, I often had the feeling that I was being led down back alleys I would not otherwise have seen. If the film itself falls short as entertainment, it's still utterly fascinating as a piece of art that tried to approach the times head on. 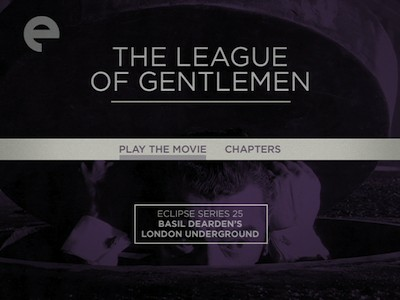 The second film in the set, The League of Gentlemen (116 mins. ), falls back on more conventional genre trappings--it is a heist picture--and so it has aged and works better as cinema than Sapphire. It is no less of its time, however, as its band of crooks are British veterans who are bored with life after wartime and feeling disenfranchised. They "did their bit," as they say, but life has been no picnic in the intervening decades. Interestingly, they aren't noble soldiers fallen on hard times, they all have checkered backgrounds. Dearden doesn't avoid pat stereotypes about the Greatest Generation so much as he dances around them. Colonel Hyde, played with acidic stoicism by Jack Hawkins, gathers together a group of ex-officers whom he knows to have had questionable careers and cajoles them into a cracking caper. His theory, which he bases off a dime novel called The Golden Fleece, is that if a group of military brass approaches a bank robbery with the same discipline as they would approach a battle, then there will be no stopping them. His group is a ragtag collection of personalities, including an old con man who poses as a priest (Roger Livesey) and a gentleman gambler (Nigel Patrick again). The film chronicles their preparation, including robbing an army base for weapons and supplies. (Another sign of the times: they affect Irish accents so the blame will be put on the IRA.) Once things are together, we then see Hyde's incredible plan. The theft is excellently staged, like a British Ocean's 11, complete with the style and wit that made that original Rat Pack film a bit of a hoot. The League of Gentlemen has a gravity not found in the Vegas heist, however; these aren't men living the high life. The rascals have one more opportunity for adventure, and perhaps more important than the money is the camaraderie of the group. They are part of something again, and it gives them purpose. It's the British cliché of the "stiff upper lip"--the movie's sharp tongue and immaculate appearance covers for the heavy heart that beats just underneath. 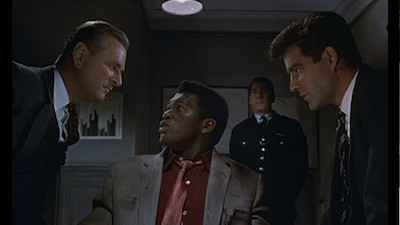 The 1961 film that followed League of Gentleman is more grounded in its drama and has more in common with Sapphire, including screenwriter Janet Green. Victim (100 mins.) stars Dirk Bogarde (The Night Porter) as Melvin Farr, a well-known barrister whose secret life nearly goes public when a boy (Peter McEnery) he shared a brief relationship with is caught in a blackmail racket due to an incriminating photo of the two of them. When the boy is pinched for stealing money to pay the extortion, he ends up killing himself. Overcome with guilt and a sense of duty, Farr decides to investigate the crime and put an end to this victimization of homosexuals. At the time of the movie, being gay was a crime in England, and as Victim points out, the law against homosexuality ended up doing more harm to one class of people than it helped any others. The legal stigma left gay men open to this kind of attack. Crooks could take advantage of their desire not to be exposed. Surprisingly, Victim doesn't tiptoe around the issue or couch it in euphemism. Though it begins as a thriller with a central mystery--we aren't sure why the boy is in trouble or what he's intending to do--once the secret is uncovered, there is no pretending otherwise. Victim depicts gays secretly congregating in bars and even questions how someone like Farr ended up married and passing as straight. The ring of blackmailees spans all manner of society, be it blue collar workers like the dead boy, car salesmen, or famous actors. 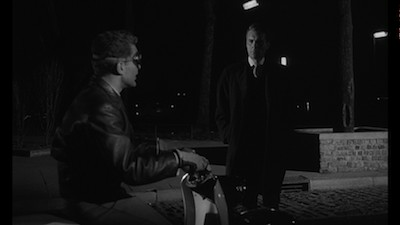 There is some tendency for proselytizing here--the policemen in particular are saddled with especially clumsy exposition, just as they were in Sapphire (perhaps it's Green, though she co-wrote Victim with John McCormick)--but the movie otherwise deals with the material in a way that maintains the integrity of the story. Dirk Bogarde is extremely good in what was likely a risky role. Even these days an actor who plays gay, whether he is gay or not, often ends up perceived as such. Bogard handles Farr's sadness and disappointment in himself quite well, showing how brittle the man's situation has become. It's a difficult state of affairs: he might finally be able to be himself, but the cost will be high. The film had its own share of troubles. It was given an "X" rating in England, and U.S. censors tried to have the word "homosexual" removed, severely limiting the film's options for where it could be seen and by whom when Dearden and his producing partner refused. Though the title of the box is Dearden's London Underground, one interesting thing about Victim is how much the gay lifestyle is seen as aboveground. Dearden doesn't take us into seedy bars hidden away, but instead shows his characters in neighborhood pubs where everyone knows who they are but turn a blind eye. This adds to the effectiveness of the political message: gay men are among us, they are getting along fine, so why subject them to these unfair practices. It's an intelligent use of storytelling as allegory that works with the images and the scenario rather than relying on preaching or other heavy explanations. The system is seen working against itself, and that is illustration enough. Dearden's jazz world retake of Othello, the 1962 drama All Night Long (91 mins. ), hearkens back to Sapphire in terms of its portrayal of interracial romance, but this time around, the union between black and white is not looked at as something scandalous. On the contrary, within the multiracial world of music, it's just a fact of life. Paul Harris and Marti Stevens play bandleader Aurelius Rex and chanteuse Delia Lane, a jazz power couple who are celebrating their first anniversary in an out-of-the-way nightspot. The story transpires over a single all-night jam session, including real-life legends Dave Brubeck and Charles Mingus. Set to a constant soundtrack of incredible music, All Night Long's rhythm is set, like all music, by the drummer. Patrick McGoohan (The Prisoner) plays Johnny Cousin, the manipulative skins man who is looking to break out of Rex's shadow and start his own band. Johnny needs Delia to front the group if he's going to succeed, but she has been retired since marrying Rex. So, Johnny sets in motion a plot to convince Rex that his current manager, Cass (Keith Michell), is making time with his wife. Once passions explode, the marriage will be kaput, and Delia will go back to work. Basil Dearden, staging a script by Nel King and Peter Achilles, comes alive in this restricted setting, using the upstairs and downstairs and the side rooms of the club to create a physical puzzle box where he can move the different pieces of the narrative around. McGoohan is also amazing as the craven Johnny Cousin, oozing slime from every pore while playing his cohorts against one another. A lot of the other acting is a little stiff, though Richard Attenborough, who was also in League of Gentlemen, stands out as the owner of the club. For many, the star of the film will be the music. Led by composer Philip Green, the revolving group of musicians, which also includes Johnny Dankworth and Tubby Hayes, is infections and keeps the movie bopping along, aiding its otherwise slim plot. Dearden shoots much of the jazz up close, and he lets the music affect the mood and, in a Shakespearian flourish, even the weather outside the club walls. It's fun stuff, and it closes out London Underground on an upswing. All four movies here are presented in a widescreen 1.66:1 aspect ratio. Sapphire is in color, the other three are in black-and-white. The print sources are very good, and Criterion presents a clean picture with very little digital noise or other extraneous elements (i.e., no significant instances of dirt, scratches, etc.). The tonal balance is good, with solid blacks and sharp contrast between the lighter picture elements. All four movies have a mono soundtrack and they sound uniformly very good. There is neither any nagging hiss nor glitches, all of the dialogue is clear and the music plays well without any distortion. English Closed Captioning is available on all four discs. The Eclipse Series 25 set maintains the packaging style established early in the line and used consistently since. Each film comes in an individual slim case, and they have a vertical loading box holding them all together. There are no extras on the discs, though each movie gets liner notes specific to the production printed on the inside of their cases, and these essays are essential to getting the bigger picture of what Dearden was up to. 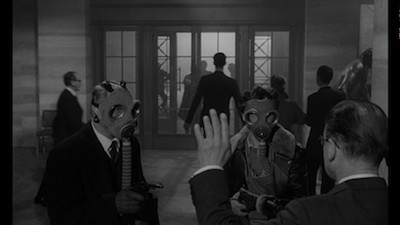 Basil Dearden's London Underground is another great surprise from Criterion's Eclipse series. Staying true to its mission statement of bringing lesser-known material to movie fans in an affordable package, their newly released quartet of early '60s British movies sheds light on a progressive filmmaker tackling challenging subjects in ways that are surprising both for their innovation and Dearden's ability to work controversial material into traditional genre forms. A murder mystery, a bank heist, a blackmail sting, and an extended jazz party end up setting the stage for examinations of race, sexuality, and individual purpose. These aren't perfect films, but they are, for the most part, perfectly entertaining, and they make me eager to find more of Dearden's films and see what else this versatile filmmaker got up to, both prior to 1959 and after. Highly Recommended.